City Divers and INON UK London have teamed up to create the City’s only INON UK Underwater Photography Academy. City Divers underwater photo pro is Steve Warren, co-designer of the INON UK Level One Underwater Photography Course. The INON UK Level One Underwater Photography Course is the first in the world to be endorsed by a major underwater camera equipment manufacturer. City Divers and INON UK has created a full program of autumn and winter talks, pool based underwater photography events and INON UK underwater photography courses to help you enjoy successful picture taking on your next dive trip. You can also purchase INON, Recsea, Fantasea and Olympus underwater photography equipment from City Divers in London with the full support of INON UK. City Divers is the only official INON UK dealer in central London. Successful underwater photography is equipment dependent. Steve is really an equipment consultant, rather than a salesman. He’s advised beginners buying their first camera through to professionals filming for TV. An underwater stills photographer for over twenty years, Steve has also filmed underwater for both the BBC and ITV. City Divers is the only official INON equipment dealer in central London. Steve will be happy to personally advise you about underwater camera equipment purchases through City Divers. City Divers and INON UK London will host three special presentations to help you successfully start or improve your own underwater photography. 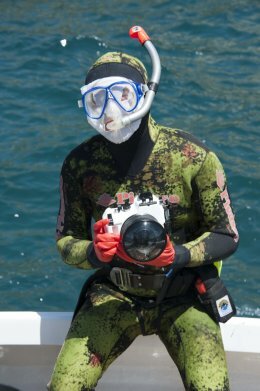 These talks are mostly aimed at those divers who are planning to start underwater photography or have already taken some pictures, but find themselves struggling to get the results they’d hoped for. The talks assume no previous knowledge of land or underwater photography, but are emphatically not dumbed down. Talks are geared around using compact underwater cameras. However, anyone with an interest in underwater photography is welcome to come and ask Steve off topic questions. Many divers are bitterly disappointed by the underwater photographs they’ve taken on precious diving holidays. Pictures are often blurred and lack the vibrant colours the diver remembers seeing. In this presentation, Steve is going to explain the reasons underwater photography is so challenging and discuss some of the solutions. The truth is setting cameras on auto, program or underwater mode rarely results in pleasing underwater photographs. Another problem is that underwater photography is equipment dependent, but a lack of product knowledge and limited understanding of the role equipment plays means retailers often provide poor buying advice. Steve is going to dispel some of the underwater camera misinformation that does the rounds such as video lights can replace an underwater strobe for stills photography and why compact cameras with macro settings actually need additional close up lenses to take macro pictures. You’ll walk away from this presentation with some techniques you can use immediately to improve your next set of underwater photographs and you’ll also learn how to avoid buying the wrong equipment. 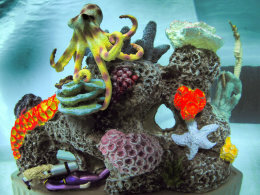 Blurred pictures with unpleasant green or blue colour casts are a common problem for the new underwater photographer. Miss-selling of equipment and misinformation often leads beginners to depend upon auto and underwater modes and this is often the result. Steve’s talk explains causes of the problem and offers easy to implement solutions. Camera taming – why modern cameras are needlessly complicated and how to keep it simple. 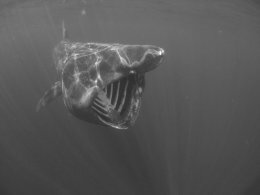 Auto settings do have a place in underwater photography, such as when taking this basking shark off Cornwall. However, most of the time manual settings will produce much better underwater photographs. INON UK London programs with City Divers will teach you how to easily control your camera and strobe manually yourself and when it is safe to rely on auto settings. 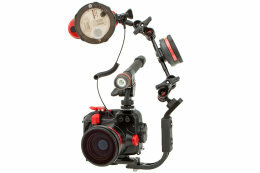 Most divers recognize that an underwater strobe is an essential tool for almost all underwater stills photography. Underwater camera strobes provide illumination in dark conditions, restore colour and allow us to light creatively to give our underwater images more punch. But there is also a lot of confusion about underwater camera strobe terminology and misunderstanding of strobes limitations. Understanding which strobe features are essential and which are not will help you make informed buying decisions. Many new, and even experienced underwater photographers, also fail to appreciate the importance of a good strobe arm to achieving well-lit underwater photographs. Steve is going to explain strobe functions and applications and is also going to provide guidance to help you position your underwater strobe for backscatter free, even lighting, even with wide-angle lenses. Under some conditions, such as in water that has a lot of particulate in it, you might be better to avoid using an underwater strobe. Sherman tank, Gibraltar. A useful technique many underwater photographers use is called close focus, wide-angle. A wide-angle lens is placed very close to a small subject, like this coral, and lit with fill flash. Even though the photographer is shooting directly into the sunlight, manually controlling exposure has enabled him to create a dark background to emphasis the colours of the coral. Egyptian Red Sea. A single INON strobe, correctly aimed, lights a lionfish at night on Temple in the Egyptian Red Sea. Proper strobe positioning prevents backscatter and lights your subject evenly. Steve will show you how. This presentation is based on a lecture from the popular INON UK Level One Underwater Photography Course, but has been expanded for City Divers. Composition and Other Top Tips for Underwater Photographers shares some simple to follow guidelines for making underwater photographs with real impact. Underwater, we often have to work fast against the clock and under difficult shooting conditions, so efficiency is essential. By following these simple but effective suggestions for composition, you can improve your success rate. This presentation also equips you with lots of top tips on how to plan ahead for successful underwater photography and avoid disappointment, including sources for researching suitable destinations and predicting marine life events. Getting the best underwater photographic opportunities often depends upon understanding the effect of seasons on marine life activity, working with top guides and being able to dive specifically to take pictures, rather than being treated as just a diver with a camera. Here, Webster Mendoza, a specialist photo guide works with an underwater photographer in the Philippines. 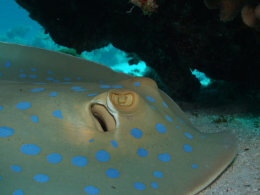 City Divers has a quarter century’s experience of running successful overseas diving safaris. 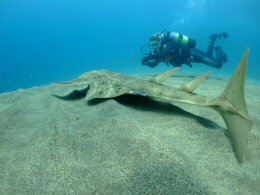 Used in both Diver and The Sea Magazine, this image of an angel shark off Lanzarote was taken with just a Fuji 6MP compact camera equipped with an INON UFL165AD fisheye lens. Image quality from compact cameras is now high enough to satisfy the needs of an increasing number of publications. This is a one-day classroom based course designed to help underwater photographers get to grips with the increasingly complex, confusing and seemingly endless features and functions of digital underwater camera equipment. Many of these features are not really useful to underwater photographers and it is often the ones that you think will help you that don’t! In fact, they often mess up underwater pictures. On the other hand, some camera functions can make your underwater photography much easier and more rewarding if you understand when to use them. Adding further complexity is the fact that an underwater photographer will often have an underwater camera system that combines multiple manufacturer’s products including camera, housing, lenses and strobe. All of this equipment has to work together and, especially when it comes to compact underwater cameras, inaccurate information from retailers and other sources can create serious incompatibility issues. Moreover, particularly when underwater strobes are used, specific camera and strobe settings have to be matched correctly. This course was developed by INON UK to help prevent many of the common equipment problems we saw underwater photographers struggling with. Basics of exposure – shutter speeds, apertures and ISO. Advanced exposure including metering patterns, exposure compensation, dynamic range adjustments. Focus modes and which is appropriate for different subjects including single, continuous, tracking, predictive and manual focus. Drive settings including single and continuous, buffer limitations, effect of shutter speeds, focus modes and flash settings. Image quality, file size and aspect ratios. Monitor – understanding the information displays, brightness settings, compositional aids and focus assist. Built in flash – Fill in flash, manual flash, flash compensation, 1st and 2nd curtain sync, slow sync, red eye reduction, recycling time. External strobe and its relationship to the built in flash. How to synchronize camera flash and strobe. Strobe exposure modes including S-TTL, auto and manual. Exposure compensation. Effect of camera metering pattern. Recycling time. High speed shooting and limitations. Modelling lights and focus assist lights. 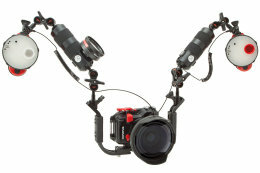 Angle of coverage including light modifiers such as diffusers, snoots and colour filters. Caring for your equipment – flood prevention and basic care and maintenance. This is a fun way to have a go at underwater photography under Steve’s expert guidance and with all underwater photography equipment supplied. Over an hour long pool session, you’ll get to try a selection of underwater photography activities, including taking replica fish portraits, close up critter pictures and images of divers. Along the way you’ll learn a few basic shooting techniques as well. Bring your laptop so you can download your images after your photo dive for your personal debrief with Steve. Realistic props are used to help you hone your underwater photography skills and master your underwater camera equipment. “I’VE BEEN A PHOTOGRAPHER since I was 11 and a professional photographer both on land and under water since 1994. I have seen quite a few underwater photography courses for compact camera users, and while I would hate this review to end up sounding like an ad, I believe this is the most professional, intelligent and well thought-out I have come across so far”. Developed in 2009 by Mark Koekemoer of The Underwater Camera Company and INON UK’s Steve Warren, we believe this is the first underwater photography course to be endorsed by a leading underwater photography equipment manufacturer. The course has been acclaimed by students. It has also been highly rated by scuba instructors who have taken the Level One instructor course with INON UK. The success of the INON UK Level One Underwater Photography Course is founded on three cornerstones. It begins with the belief that underwater photography is not a diving specialty, but a photographic one. Diving is simply the means by which you get to your location and subject. This course is all about understanding photography principals and applying them to working underwater. Second, the course includes essential theory, practical skills and practice time. By essential we mean our course includes the minimum content we have found divers need to take good underwater pictures. We don’t think you can scrape by on less. Thirdly, you’ll be personally taught by Steve, who has an exemplary reputation as an underwater photography coach. Underwater photography is not a diving specialty, but a photographic one. Diving is just how you get to your studio. INON UK underwater photography courses are designed with this distinction in mind. The INON UK Level One Underwater Photography Course assumes no prior knowledge of land or underwater photography. it was originally designed as a beginner’s underwater photography course for divers. However, many experienced underwater photographers who had already taken other underwater photography courses and a significant number of underwater photography instructors who had qualified to teach underwater photography through other training agencies have chosen to take our Level One program. This in itself tells you something interesting about our course compared to others – why would anyone who had already taken one beginner’s underwater photography course believe they would benefit from taking our beginners course as well? It was based on these individual’s feedback that we now describe the INON UK Level One digital underwater photography course as covering beginner to intermediate underwater photography. This is a much more comprehensive starter underwater photography course than you might expect. However, from experience, we believe the content of our course is really the minimum required to enable you to take pleasing pictures in good visibility, consistently. We want to take the luck out of your underwater photography and replace it with knowledge and technique. After all, luck cuts both ways. The INON UK Level One Underwater Photography Course helps you take great holiday pictures in clear water consistently. Although aimed at divers using compact cameras, many people who use more advanced cameras have attended and benefitted from the INON UK program. There are six classroom presentations during the INON UK Level One Underwater Photography Course. These provide essential information that will help you understand the unique problems underwater photographers face and what the solutions are. The INON UK Level One Underwater Photography Course ensures you know the why’s that underpin the how’s. We build your knowledge in small logical steps. We’re not out to overwhelm you with information, just to ensure you leave our course with “must have” knowledge. Each of the first five modules finishes with a brief multi – choice evaluation. This helps Steve ensure he is getting his points across so he can quickly clarify any confusion. Part 1: Light – How we see and how cameras record an image is all based on light. Light has many qualities and is altered radically when it passes from air into water. These differences between how light behaves in air and underwater is something you need to understand. Intensity, colour and contrast are all reduced underwater, while particulate that blocks, diffuses and scatters light is added. Not appreciating these differences is one of the main reasons why so many divers find underwater photography disappointing and frustrating. Light and water are fierce adversaries of the underwater photographer! These elements affect brightness, shadows, colours, contrast and sharpness. Understanding the problems helps you understand the solutions and put them into practice to take better underwater pictures. Part 2: Camera basics - Today’s cameras can seem bewilderingly complicated. 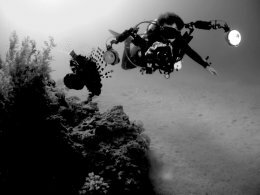 Many divers set their cameras to program, auto or underwater mode, yet often the results are very poor. Many photographs appear blurred with drab colours. Even when the pictures are acceptable, automatic settings make it difficult for the photographer to know why the camera did what it did and hard to reliably achieve good results the next time they dive. Steve will show you how to make your camera take satisfying pictures, consistently, in good visibility, by following a few simple guidelines and using the minimum of controls. He’ll demystify all the jargon and explain the main controls you do need to use, and how and when to use them. Part 3: Restoring colour using just natural light. Getting rich colours in your underwater photographs is essential to producing images with impact. Steve will explore the importance colour plays in creative underwater imaging later on in the course. To begin with he’ll simply show you how to get vibrant colours in your underwater photographs without using underwater strobes or video lights. This is a very useful method for shooting large subjects, like wrecks, as well as shy animals that dislike flash. He’ll discuss colour loss through water and explain how to restore colours using your cameras white balance controls and how and why filters can further enhance the look of your natural light images. Part 5: Lenses. Underwater photography is much more equipment dependent than most land photography is. Partly this is because our choice of stunning subjects is so wide. We might want to shoot a huge sunken liner and a fingernail sized nudibranch living on its deck during the same dive. We rely on a selection of lenses to provide the versatility we need to portray all these opportunities. Understanding the role of lenses will ensure you always choose the right lens for the subject and conditions. Steve will explain the difference between standard lenses, wide – angles, super wide – angles and relay lenses as well as what sets close up, macro and super macro photography apart from each other. 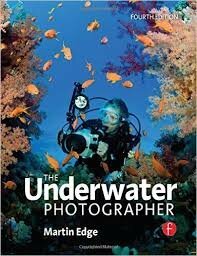 The Underwater Photographer by Martin Edge is our recommended course manual. Steve is a contributing author. Part 6: Technique. The INON UK Level One Underwater Photography Course was designed to give you the knowledge, skills, practice, equipment familiarity and experience to help you succeed as an underwater photographer. Steve’s techniques presentation will help you plan your future underwater photography trips by explaining the ways pro’s stack the odds in their favour. He’ll also share some simple, reliable composition rules that will help you stop taking snapshots and start making underwater photographs to be proud of. You’ll learn how to frame your pictures to maximise impact, the role colour plays in creating striking images and how to exclude backgrounds that distract. A valuable part of your INON UK Level One Underwater Photography Course could easily save you all your course fees and a wasted underwater photography trip. We teach the procedures you must follow if you want to avoid flooding your expensive camera equipment. The underwater exercises you’ll complete during your Level One Underwater Photography Course with INON UK London and City Divers begin by reinforcing what you have learned in the classroom sessions. They convert theoretical discussions into hands on, real world techniques you’ll understand and apply on your future photo dives. Practical sessions include exercises that show you how to compensate for the effects of water, how to prevent motion blur and manually control exposure. You’ll work with different types of lenses to shoot wide – angle, close up and macro pictures to learn how to tackle subjects from large to small. Mastering how to evenly light pictures and avoid backscatter when using a single underwater strobe are vital skills you’ll also practice and refine. Along with learning all these basics, you’ll also be introduced to creative techniques, such as how to shoot close focus, wide-angle pictures and darken backgrounds to add impact to your images. Following each photo dive there’s an extensive debrief of each student’s images. This is a very important part of your learning process. It takes considerable experience of taking underwater pictures to be able to fully recognise, diagnose and explain what might be going on in a photograph. The instructor needs to be able to identify exactly why a shot has worked or not worked technically and offer solutions, where needed, as well as provide tips on composition. Steve brings a lot of insight to his picture debriefs from his long experience of working with magazine editors. Steve’s work is regularly published and he’s filmed underwater for both the BBC and ITV. He brings this experience to your personal picture debriefs. Here he prepares to photograph an infestation of stinging jellyfish for Diver Magazine. To fully benefit from the INON UK Level One Underwater Photography Course you need to learn to use and practice with essential underwater camera accessories including wide – angle and close up lenses and underwater strobes. INON UK London provides use of complete compact underwater camera systems for each of our City Divers students at no charge. There’s no sharing of cameras between students, which would halve your learning opportunities. Many students like to use their own cameras. However, it is often the case that their own camera isn’t equipped with the lenses and strobe you’ll need to use to get the most from your course with Steve. Sometimes, if you don’t already own the appropriate accessories, we can loan you these to use with your own camera if it has compatible fittings. What you learn using our underwater cameras can easily be transferred across to your own system. We do ask for a deposit against loss or damage of our equipment, as you’d expect. ‘Steve is generally patience personified’ – Steve Weinman, Level One student and editor of Diver Magazine. Mick Hamilton, owner of City Divers, and Steve have been friends for over twenty years. Both served on the editorial board of Dive International Magazine and were regular contributors. Steve’s background in underwater photography dates back to 1994, when he took over underwater photography retailer Ocean Optics. In 2011 Steve co-founded, with Lisa Collins, INON UK to import, distribute and retail INON underwater camera equipment. With Mark Koekemoer of The Underwater Camera Company he co-designed the INON UK Level One Underwater Photography Course and has personally taught the program to over 120 students and INON UK instructors. Steve has worked extensively in dive journalism and has filmed underwater for the BBC and ITV. 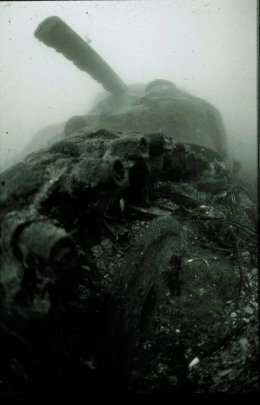 He was a contributing author to Martin Edge’s The Underwater Photographer, considered by many to be the bible for underwater photographers. He has been a speaker at the London, Birmingham and Irish dive shows and co-founded the Visions in the Sea Underwater Photography Festivals. Steve Warren about to dive with the INON Test Team in Japan holding a prototype Go Pro wide-angle lens system. Steve is City Divers underwater photo pro. He co-designed the INON UK Level One Underwater Photography Course and has taught the program to more than 120 INON UK students and instructors.